At first glance Woolx appears to be the new kid on the block in the Merino wool underwear business. Though the brand launched in the fall of 2013, its parent company, Hanks Clothing of Endicott, New York, has been an outdoor retailer since 1949. Woolx aims to differentiate itself through careful attention to details and durable quality, and the brand is throwing haymakers out of the gate with the X-Tremes Ultimate Hoodie for men. Made of 100% Australian Merino wool, the X-Tremes hoodie is said to be a product of eight prototypes, uniquely tailored for winter recreational activities. Naturally, I was happy to put it to the test. This isn’t your grandfather’s wool. Had I not known better, I wouldn’t have guessed wool at all. The outside has a smooth, rugged texture that feels as if its genealogy belongs in a soft shell family tree. Itching is not a concern, and the interior is fleece lined for a cozy feel. I’m a tweener when it comes to sizing, somewhere between a medium and large, and the tapered cut enabled the large to simply feel right. It kept me toasty warm for a day in my icebox of an office, and at home absorbed baby drool like a champion burp cloth. I couldn’t wait to get it in the field. A 17.6-mile February hike of 4,265-foot Bondcliff in New Hampshire’s White Mountains. Starting in the early morning with temperatures in the low 20s, I wore the X-Tremes hoodie with only a thin, dry-wick layer underneath. It kept me warm from the get-go, even before I worked up my body heat. Though the hoodie is tapered, it has enough elasticity so that I never felt my range of motion was constricted. As I closed in on the summit and the reported 65-mile-per-hour wind gusts picked up, I could feel the wind’s chill through the garment. This wasn’t unexpected, and so I donned the hard shell for the final summit push. Once out in the open, I preferred the X-Tremes’ hood with a liner hat underneath over the hard shell hood, and my hairless dome stayed ignorant of the cold. The biggest surprise came when I returned to the base of the mountain and made the 4.4-mile trek out. The temperature had risen into the low 40s and I thought for sure I’d be sweltering. Granted, I’m not a big guy, but the hoodie offered enough breathability for me to remain comfortable. The X-Tremes Ultimate Hoodie comes as advertised—warm, breathable, comfortable, and well thought-out. The only unknown for me is whether it will stand the test of time (I’ll have to report back after many washes). 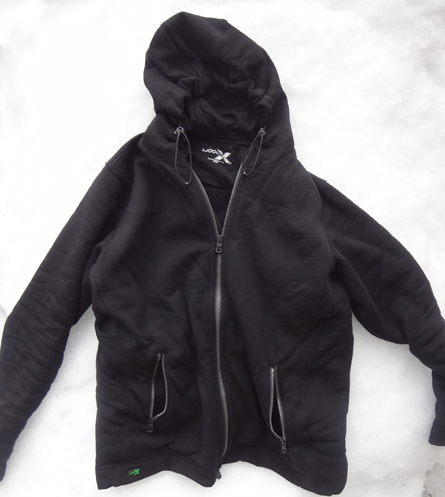 It’s an ideal cold-weather garment for skiers/boarders, snowmobilers, hunters and, yes, hikers. I for one will be putting it into rotation for winter hikes; it offers a wide temperature range perfect for layering with a hard shell. I have to stop short of recommending it to thru hikers or multi-day backpackers due to weight; in situations where the hoodie would be stowed more than worn, it’s hard to justify it over a down jacket. Disclosure: Northeast Hikes was provided an X-Tremes Ultimate Hoodie by Woolx for the purpose of this review.